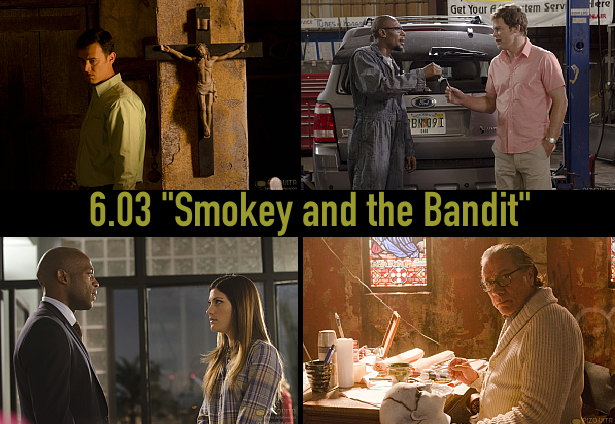 Tonight: the re-run of the third episode of season 6 "Smokey and the Bandit" on Showtime. The episode was written by Manny Coto and directed by Stefan Schwartz. "You're going to die as a sad old man...of a heart attack"
Yeah, I like this episode, it feels thought-provoking without being overt about it. Haha, that's a good question. It took you until now to notice? I've heard rumors about this strange thing called "humor". If I were writing that and intended it to be humorous, it would be the last item in the list, as in "sentenced for life for arson, murder, and jaywalking". This, however, looks like someone didn't learn his phobias. Anyway, a *true* phobia is a medical condition and one could argue that selective treatment of people based on it would smell of illegal discrimination. Homophobia I would understand, since it's not a medical phobia at all. We're a bit off topic here. Let's talk about Breaking Bad.